In wenigen Stunden geht es los. Die New York Toy Fair 2017 beginnt. Hier haben wir schon schon mal zwei Bilder, die uns auf das Spektakel einstimmen. 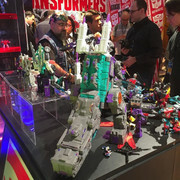 Jetzt können wir euch das Toy Fair 2017 Transformers Panel zeigen. Wir werden es immer wieder neu aktualisieren, damit ihr immer auf dem Laufenden seit. Als Quelle geben wir hier tfw2005.com an. 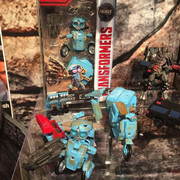 Transformers The Last Knight toyline has been showcased. 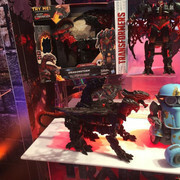 Highlights include both Voyager and Leader class Megatron toys, new Voyager versions of Hound and Scorn, a new character – Steelbane – who is a dragon. 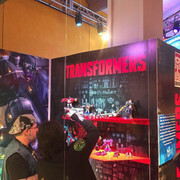 Young audiences line is “Allspark Tech“, an Allspark cube can be plugged into toys in the line to activate lights and sounds. 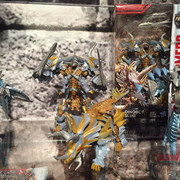 The three headed dragon is named Dragonstorm, and his gimmick is Cyberfire. He’s a “Mega Turbo Changer”. Street date for the Last Knight toys is April 24th. The line will launch with the “Reveal your shield” campaign, involving five days of reveals. Presentation is kicking off. 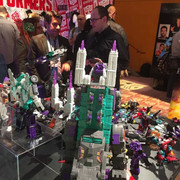 This presentation is for all of Hasbro’s brands, and they are kicking off with Transformers. Kicking off with a look at the new Forged to Fight mobile game from Kabam. This game will cover all generations, from Generation 1 to Beast Wars to the Movies and beyond. And right on to the toys! 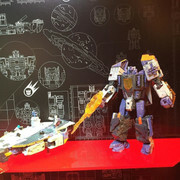 Overlord’s Titan Master partner is named Dreadnaught. Speed set on show next. 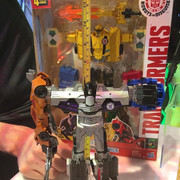 Name is officially confirmed as “Chaos on Velocitron”. 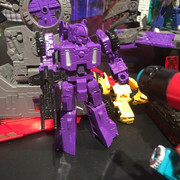 Chaos on Velocitron is a TRU exclusive. 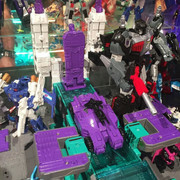 Siege on Cybertron is BBTS exclusive. 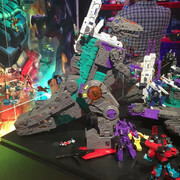 Showcasing Trypticon now. Spaceship is based on the Nemesis. 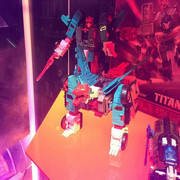 Has a seat in the mouth for Titan Masters. Invitation to come and “feed” Trypticon after the presentation. 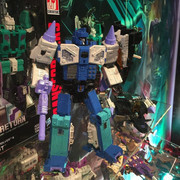 Now presenting the winner of the Power of the Primes vote. 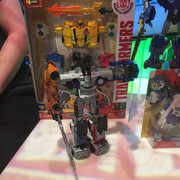 Optimus Primal won the Power of the Primes vote. Moving on to talk about Robots in Disguise. 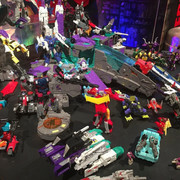 Season 3 will be Combiner Force. Showing Bumblebee and team against Menasor. 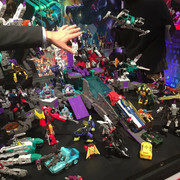 Toys shown. 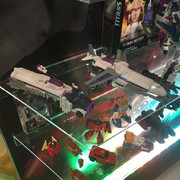 Ultra Bee will feature the main four characters of RiD, as a combiner. Galvatronus too. 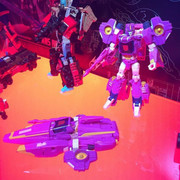 Features characters like Ransack and Cyclonus. On to The Last Knight. Steelbane on show. Single headed dragon. Robot looks like a knight. 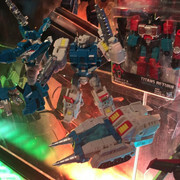 Slug, Slash, and Strafe all shown. 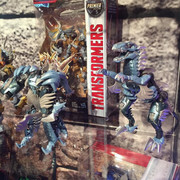 All reuses of their Age of Extinction toys. Voyager class Hound. Removable helmet. 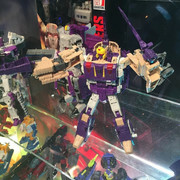 Leader class Megatron, featuring both his sword and an arm cannon. Flip out flames. Mercedes Benz version of Drift. Deluxe class. Deluxe class Sqweeks. Turns into a maintenance bay as well as a vehicle. Kid oriented line. 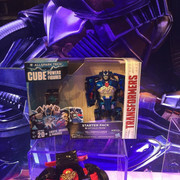 Allspark Cube will trigger lights and sounds if inserted into toy. Can attach to any toy in range. 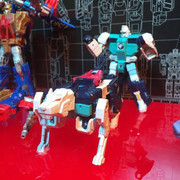 Bumblebee, Drift, Hound, Barricade all a part of the line. Dragonstorm on show. He’s the three-headed dragon. Gimmick is Cyberfire. Street date for the toys is April 24th. Moving on to Marvel, so endeth the Transformers coverage, for now. 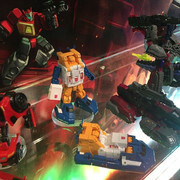 Hier kommen die ersten Bilder von der Toy Fair 2017. 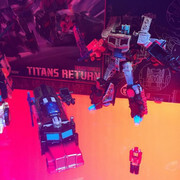 Zu sehen sind hier die kommenden Titans Return Figuren, dazu Transformers The Last Knight Figuren. 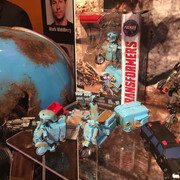 Darunter sind Movie Megatron, Deluxe Premier Sqweeks und Movie Masterpiece Bumblebee. Ein paar schöne Figuren dabei. Overlord kommt auf jeden Fall auf die Liste, ebenso Octane / Octone. 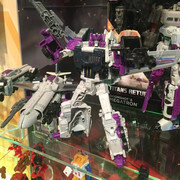 Für mich aber die große Überraschung: kriegen wir endlich einen anständigen Movie Megatron? Kann das wirklich sein? Ist das nicht komplett gegen die Tradition? Spaß beiseite, der Jet-Megatron da auf den Bildern sieht echt schnieke aus. Bin mal gespannt. Hier haben wir die Bilder von den kommenden Flame Toys und Kuro Kara Kuri Action Figuren. Diese Bilder sind von der New Yorker Toy Fair 2018. Kuro Kara Kuri bringt nicht transformierbare Figuren heraus. Das sind Drift, Tarn und Star Saber. 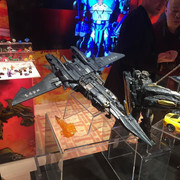 Von Flame Toys kommen die G1 Model Kits Starscream und Optimus Prime. Brian Goldner stated that Toys ‘R’ Us disruption is in the past now. Hasbro has moved on successfully. Hasbro is growing in Emerging Markets. 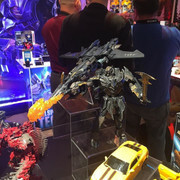 Specifically, Hasbro is planning new initiatives in China for Transformers. 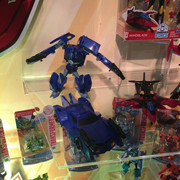 Gave a sneak peek of Hasbro: Pulse; the new Toy Shop. 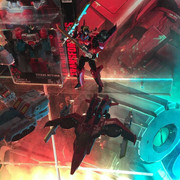 Transformers toys will hit the new interface following the Toy Fair 2019 Fan Event tomorrow (02/16/2019). 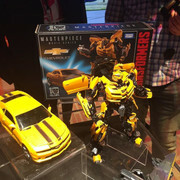 He discussed the critical and commercial success of Transformers Bumblebee. Next Transformers Live Action movies from the Transformers Universe is in production at Paramount Pictures. However, no new Transformers movie was highlighted on the current plans until 2021 (we believe that this may change and the slate will be updated later). 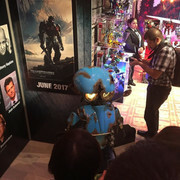 Toy production to future movies will begin 18 to 30 months prior to the movie’s release. Following the $168 million success of Bumblebee in China, a brand new Transformers Animated Series exclusive to China has been produced with the help from China Central Television (CCTV). 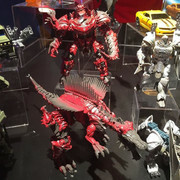 The Chinese series will also contain an exclusive toyline. Transformers: War For Cybertron animated series is in production with the help from (and for) Netflix. The series is produced and animated by Rooster Teeth (Red vs Blue) and Polygon Pictures (Transformers: Prime) respectively. Brian Also announced the 1st season of Rescue Bots Academy and Season 2 of Transformers: Cyberverse. Auf den folgenden Bildern könnt ihr sehen, was es noch neues geben wird.